A while ago I blogged about reading Body By Science (BBS) and starting high intensity training. Since then, I’ve been collecting data and experimenting with the recovery time in between workouts. Advocates of high intensity training hold that the purpose of exercise is to perform the minimum amount of work necessary to stimulate a positive adaptive response, which is muscle growth. A workout consists of several different exercises, each involving one set of repetitions, to failure. Only one set is performed, because additional sets cause more fatigue but do not stimulate more response. Training to failure is needed, otherwise the stimulus is too small to trigger a response. If your body can easily handle what you throw at it, no adaptive response is triggered. But the workout itself is only half the story. The other half is the recovery period, in which the fatigue to your muscles is being repaired and additional muscle mass is being developed. Based on data collected on clients of the authors’ gyms, BBS recommends working out once every seven days, in order to optimize muscle gain in the long run. Everyone has different recovery capabilities, but this 7-day interval is an average and should work well for the vast majority of trainees. At the very least, it is a good place to start and can be tweaked to meet your personal attribute. Insufficient recovery time leads to a plateau, or even retrogression in performance. During the recovery days I make an effort to get enough sleep, eat well, reduce stress levels during the day, and avoid any unnecessary physical activity, except for a leisurely walk if it’s sunny outside. All these things can influence the recovery. BBS also states that as you get stronger, recovery time will increase, because you are putting greater fatigue on your body each time you train to failure. Based on this logic, and since I weigh about 100 lbs and had been sedentary for some time, it should not take much work for me to train to failure, and thus my needed recovery time should be short. The data in the chart below starts on April 3. At this point, I had already trained for a few weeks, but I did not take any time-under-load (TUL) data. 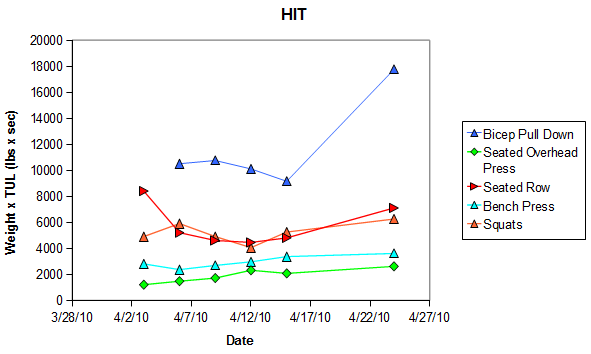 From April 3 to April 15, I trained once every 3 days, as you can see from the spacing of data in the chart. Progress can occur in two ways: either TUL has increased for a fixed weight, or the weight has increased for the same TUL. Thus I created a new parameter, plotted on the vertical axis of the chart, which is the weight multiplied by TUL. If either one increases, it will be reflected in the parameter. (In this data set, all the weights remained constant. In the future, weights will increase.) I don’t count the number of repetitions. I just focus on keeping good form and on keeping the weights moving slowly and smoothly. I make sure my joints don’t lock out and the weight doesn’t rest on the weight stack after each repetition, so that the TUL really reflects a continuous period of time in which the muscle was loaded. As you can see, the bicep pull down was added at the second workout on April 6. This had the effect of drastically reducing the performance of the seated row, which was performed after the bicep pull down. These two exercises have overlap on the muscles required (both use the biceps). This shows that performance is sensitive to the ordering of exercises within a workout. After that workout, the ordering of the exercises was kept constant for the remainder of the data. Even if two exercises use different muscles, metabolic resources will be consumed during the earlier exercise, and the subsequent exercises will be more difficult. I think this is reflected in the squats, which was the last of the 5 exercises. The performance in the squats jumped around, because it is sensitive to variations in fatigue level of the previous 4 exercises. Also, the squat is the hardest for me to maintain good form, and if I’m too tired to keep my back straight, I stop immediately. Reducing injury risk is far more important than trying to edge out a bit more intensity. But this also causes the squat performance to fluctuate. Overall, this period of training in 3-day intervals was a total failure. There was no significant overall progression, if you look at all 5 exercises together. 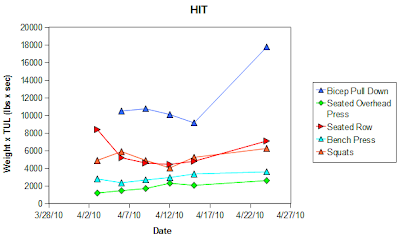 If you look at individual exercises, the seated overhead press and the bench press trended up slightly, but the seated row was mostly flat (neglecting the first data point) and the squats jumped around with no trend, but most importantly, the bicep pull down, which was the first exercise, trended downwards significantly. At this point I figured I was over-training and needed to increase the recovery time. I switched to a 9-day interval, so my next workout was on April 24. When I walked into the gym, I didn't feel particularly strong or energetic. But when I started lifting, I felt that everything was easier than I remembered, at least for the beginning and middle of each set. But towards the end of each set, my muscles were shaking a lot harder than previous workouts. As you can see, I improved in all 5 exercises, and blew away the bicep pull down, the first exercise. This proves to me the supreme importance of sufficient recovery time. Neglecting the first workout, which only had 4 exercises, there are 3 workouts with 3-day intervals and 1 workout with a 9-day interval. This may not seem like much data, but if you count by exercises, there are 15 exercises with 3-day intervals, and 5 exercises with 9-day intervals. Plus, the first, unfatigued exercise, the bicep pulldown, showed the strongest trends. With a 3-day interval, I performed a ton of work, and reaped zero benefits, aside from the “feel good” that results in working out. With a 9-day interval, I did less work but showed great progress. My data is consistent with BBS' recommendation of a 7-day interval. Some people think high intensity training is boring. I think it is anything but. By it's very nature, it requires maximum mental concentration and physical work, so it's impossible to be bored. When I watch other people work out, they are listening to music, tapping their fingers to the music, looking around, etc. They are bored because they are not doing high intensity training. Additionally, there are countless variations within the high intensity framework. In the future I might test: fewer exercises, different ordering of exercises, alternating between exercises, half-reps, max contraction, max pyramid, rest-pause, etc.